Soundsensational is a full service design and installation company that provides only the highest quality design, installation and service of electronic systems for both residential and commercial customers. We are dedicated to providing quality electronics coupled with professional installation and integration. Our web site has been designed to provide you with a description of our services, the products we sell, and the endless possibilities that you can experience by contacting us. Our company prides itself on informing and educating it's customers on how adding upgrades to their home can drastically improve their lifestyle, and give them a whole new appreciation for their home. Just tell us what you want. 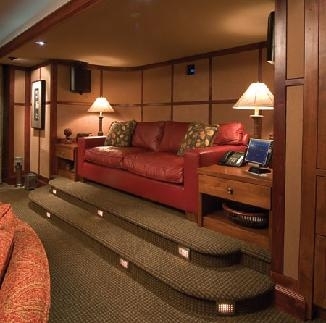 Whether it's a basic family-room surround system, or a dedicated plush home theater room? Or, possibily listening to your favorite music in one room, or maybe being able to hear music throughout your whole home? No matter what it is you desire, Soundsensational will make your wishes become reality.